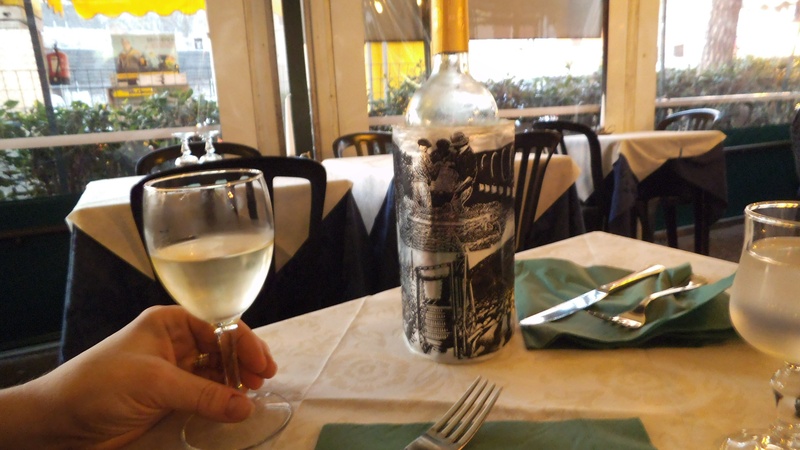 Adventures in Rome… Post 4: No Corkscrew, No Problem! I just love feeling the magic when away on holidays. It’s there alright. You just have to know where to find it. And it also helps to know when it’s staring you right in the face. It’s our first evening in Italy. We waited for four years for the chance to come back. Mentally, we are as excited as we can be for people who haven’t slept in almost two days. Frank, Jennifer and myself have now been up for almost 36 hours. We have just finished a very nice authentic Italian meal and Jen has enjoyed her first real Italian pizza. We ate just outside the restaurants front doors in an outdoor cafe. A large enclosed plastic tent protected us from the cooler weather, and a space heater kept us warm and cosy. It was after all, the last week in November. As we stroll back to our hotel, which is just down a block from the restaurant, there are all sorts of smells from food being served in the various restaurants and delis to the diesel fumes from the automobiles and Vespas. The street noise is louder than what we’re use to. The Coliseum is to our left and the Forum is to our right. Virtually across the street from our hotel is a corner store with gelato barrels displayed in the window. Jen and I leave Frank outside as we go inside. However, a display of wine bottles catches my eye. There is even a big clear refrigerator full of them. And not one bottle contains sulphites! I pick out a bottle of chilled white wine and take it to the cashier. He is asking me if I would like him to uncork the bottle. “Si,” I answer with a smile. Reaching into his pocket he pulls out what looks like a jackknife. Before handing me the bottle he reinserts the cork halfway. “Grazie…” I thanked him, as he handed me the bottle. Exiting the shop we found Frank waiting for us outside. “Everything okay?” he asked as we met him. “Couldn’t be better,” I told him…. Notice the wine cosy to help keep the wine chilled. It works like a circular ice pack. What a great idea!